it's easy to install, meaning you don't have to pay a fortune for labor, and might even be able to install it yourself. 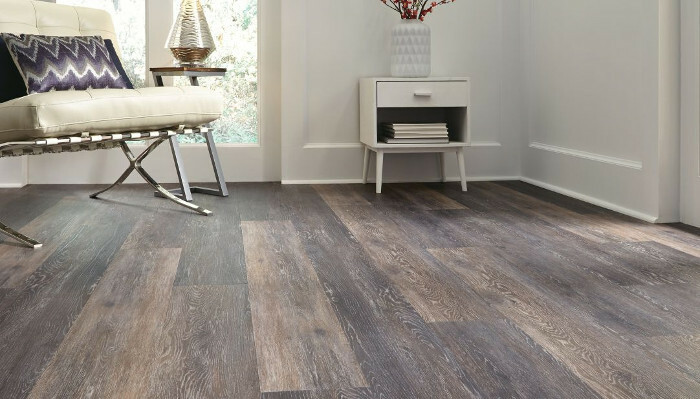 Take a read and get more details on Luxury Vinyl Flooring, and see why more homeowners are choosing to install it, and why it's here to stay. Luxury Vinyl Flooring is a style of hard flooring that replicates natural stone, ceramic tile and hardwood flooring. Depending on the look you want, it will come in tiles (for stone, ceramic, porcelain look) or in planks (for the hardwood look). You can get it flat or textured just like the natural option. Great. Check your inbox for a message from Sierra, our lead designer. A photo-realistic design of either wood or ceramic/stone is embedded onto a core of vinyl, and then overlaid with two clear protective layers. + a solid, flat layer that ensures stability and evenness during installation. Luxury Vinyl Flooring prized for it's durability, high-quality style options & versatility, and ease of installation & maintenance. The reality is that it's not hardwood, and it's not natural stone. It's hard to replicate anything with 100% accuracy, so there are some complexities that will be lacking from LVT or LVP. A Luxury Vinyl Floor will look and feel very close to hardwood or stone, but won't include the installation & product costs, required maintenance, or issues with wear-and-tear. Recent developments in Luxury Vinyl Flooring have elevated its status to one of the most popular, well-received and in-demand flooring options available. ... Planks will lie together with natural-looking seams to replicate hardwood,and tile choices can installed with grout to mimic porcelain or stone. ... The surface is exceptionally resistant to scratching, staining, or dents, and the protective layers keep your design from fading or dulling. If you're shopping for new flooring, you could likely save yourself time and money by looking at Luxury Vinyl flooring options first. You'll find the design style that you're house needs, and won't have to worry about intricate installation details. You'll pay a medium-level price per square foot at the counter, and will feel a great sense of value because you know your investment will last many years. At home, you won't have to include any new cleaning habits into your routine, since Luxury Vinyl Flooring is low-maintenance and has a surface that doesn't let dirt or bacteria stick around. Finally, you'll have peace of mind because you'll know that water, pets, stools & chairs won't damage your new floor.